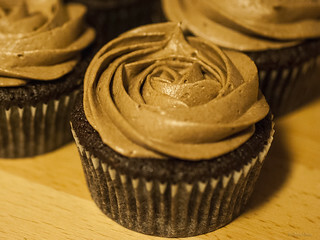 Nutella-filled mocha cupcakes with Nutella-mocha buttercream frosting | SMØRGÅSBORD! In the bowl of an electric mixer, cream together the butter and sugar until light and fluffy. Add the eggs one at a time, beating well after each addition, then add the vanilla extract. Beat again until well-blended. In a separate bowl, whisk together all the dry ingredients (flour, cocoa, baking soda and salt) until well-blended. In another separate bowl, combine the buttermilk with the coffee. Add the dry ingredients to the creamed butter alternately with the coffee-buttermilk mixture, beating thoroughly after each addition. Line baking pans with 24 baking paper cups (or muffin forms). Fill each cup 2/3 full with batter. Bake in the pre-heated oven for 15-20 minutes, or until a toothpick inserted near the center comes out clean. Using an electric mixer, cream the butter and Nutella together at medium speed until smooth. Stir in the vanilla extract until well-blended with the Nutella-butter mixture. Add the cocoa and coffee powder into the mixture, then beat until well-combined. Add the salt if the mixture has become too sweet. Gradually add the cream until you have reached the desired consistency, then increase the mixing speed to «high» and continue beating for about another minute. Spoon the buttercream frosting into piping bags (if using immediately), or store in tightly sealed containers for later use. When the cupcakes have sufficiently cooled down, scoop out a small portion (about 1 teaspoon) from the middle of each cupcake. 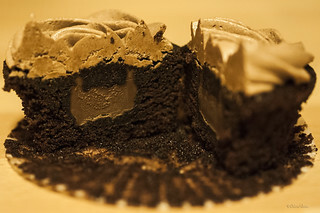 Fill the resulting holes with Nutella, then re-seal by replacing the scooped-out portion on top.